France. Around 1200 built 1971-86. 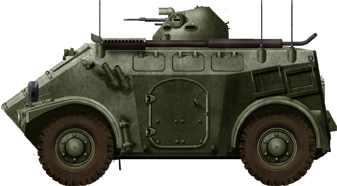 This midget wheeled APC was a private venture from Panhard, seeking derivative for its successful AML armoured car on the international market. The main advantage of this vehicle was to share 90% of the components with the latter, allowing countries that already purchased it a greater commonality of parts and simplified cheaper maintenance. The Panhard M3 made its first tests in 1969 and was revealed commercially in 1970. Production started in 1971 and allowed the AML production line to run until 1986. At that stage, several upgrades package were available. The M3 was chiefly distributed in Africa and in the Middle East (28 countries total). It is still in service in at least 23 of them today. 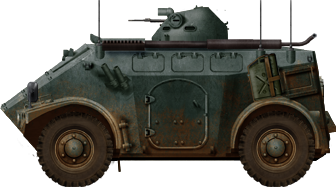 Despite its small dimensions, the interior of the M3 is roomy enough to accommodate a central front driver, a gunner, and ten infantrymen, seated in a central bank. Access is granted by two side doors and a rear two-piece door with pistol ports. In addition, there are three hatches on top on the sloped roof. The sloped, angular body armour is made of cold steel rolled RHA, entirely welded, and waterproof. Armour is about 12 mm (enough to resist 1950s HMG rounds) and 8 mm elsewhere protecting against small rounds and shrapnel. The driver possesses a small hatch over open, opening to the right, and dotted with three daylight periscopes covering the front angles. However, the centre one could be swapped for an image intensifier for low visibility and night driving. The Panhard 4 HD engine is the same as for the AML, but placed transversally behind the driver. Each of the four suspensions systems (one for each wheel) counts on a torsion arm combined with a coil absorber and a shock damper. In addition, the roadwheel tyres are made bullet/damage proof by a Hutchinson inner tube. The M3 has amphibious capabilities: Once afloat, it can steer using the large roadwheels, also providing the motion. 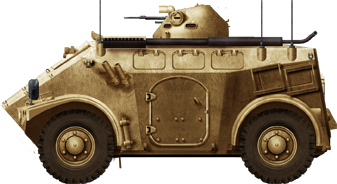 The armament is modular, ranging from light to heavier weapons with or without turret depending on the version. 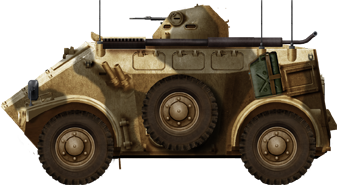 The VTT equipped with the TL.2.1.80 turret could have either a twin 7.62 mm FN MAG machine guns, one 7.62 mm machine gun and three LRAC F1 anti-tank rocket launcher, or one 7.62 mm LMG and one LRAC F1. With the open CB.127 ring mount, a 12.7 mm M2 Browning machine gun can be carried. However with the smaller STB ring mount (hatch opening forward to form a shield) one 7.62 mm LMG is carried. The reinforced CB.20 M621 ring mount can receive with 20 mm auto-cannon. There is also the MAS T 20.13.621 turret with AME 20 mm auto-cannon, and the HOT versions (Four HOT long-range anti-tank missiles). 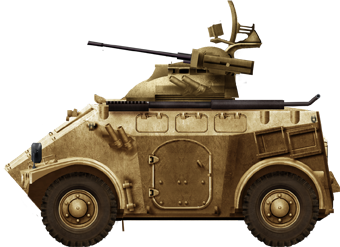 The VDA uses a twin 20 mm auto-cannon mount, while the VPM and VTT 60P had a 60 mm mortar (see variants below). 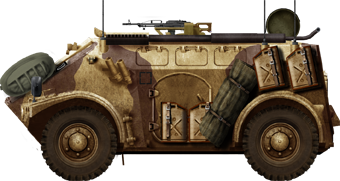 Due to the height of the vehicle and possible stability problems, the weight of armaments placed on the roof was limited. 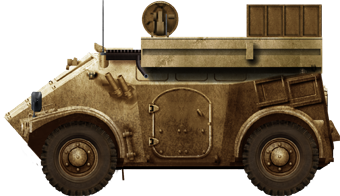 M3 VTT For “Véhicule de Transport de Troupes” or APC, the basic version, either with or without turret and LMGs/HMGs. 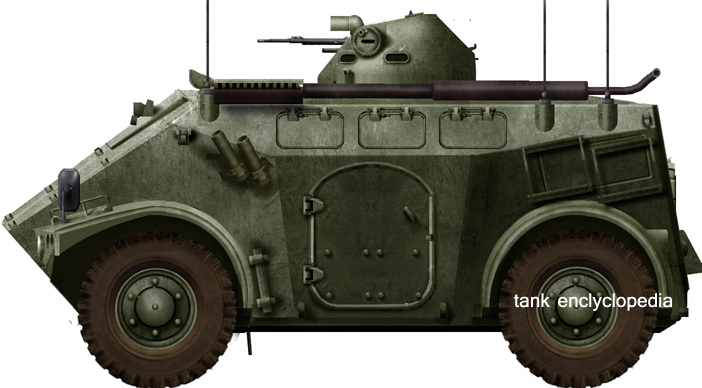 M3 VDA For “Véhicule de Défense Antiaérienne” or AA defence vehicle, with a twin 20 mm cannon and day sight plus RA 20 series radar on the turret rear in option. The chassis was reinforced as this was the heavier version of the type. M3 VAT Repair variant, crew of 5, pulley block with struts and tackle, cutting equipment, generator, benches, vice, towbars, tow cables and extra tooling. M3 VPC Command vehicle with additional com. equipment, batteries, map tables. M3 VLA The engineering vehicle, with removable hydraulically operated dozer blade at the front. M3 Internal Security Fitted with a front-mounted obstacle clearing blade and other equipments. M3 VTS ambulance. Crew of three (driver and two orderlies) 4 stretchers, six seated or 2 stretcher, 3 seated capacity. Single-piece rear door. M3 VSB radar. RASIT battlefield surveillance radar or RA-20S air surveillance radar. The latter could assist radarless M3 VDAs. M3 VLM. Turret equipped with the breech-loading 81 mm mortar muzzle. M3 VTT 60B. The roof is open to make room for same mortar. Easy conversion kit. Algeria (44), Angola (8) and apparently the National Liberation Front of Angola captured one, Bahrain (110), Burkina Faso (13), Burundi (9), Chad (10), Côte d’Ivoire (16), Democratic Republic of Congo (60), Gabon (10), Kenya (10), Nigeria (18), Rwanda (12), Sahrawi Republic (5), Mauritania, Morocco (50), Niger (22), Senegal (16), Sudan (25), and Togo (6). The biggest customers were Saudi Arabia (150) and the United Arab Emirates (370). 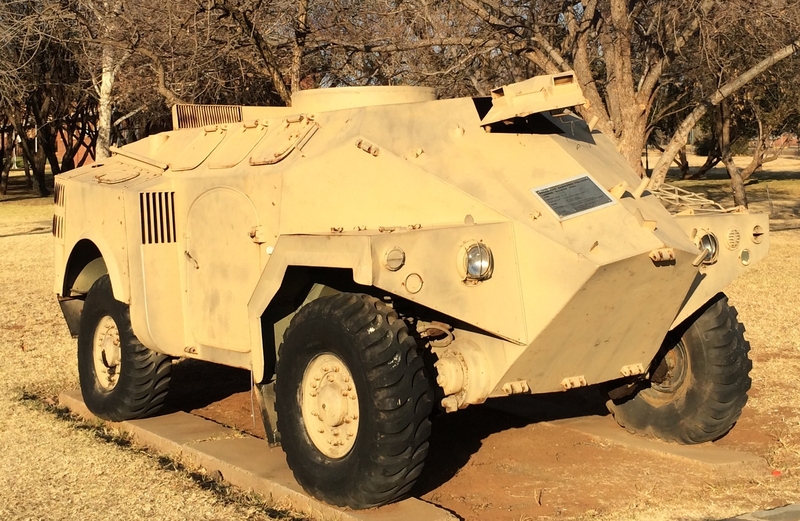 Original customer for the Eland (AML-90), South Africa tested three vehicles in licenced production as the Bosbok. In the Middle East, Iraq purchased 44 vehicles, Lebanon purchased 60 M3 and are 15 still held in reserve. In South America, Paraguay is still operating 12 vehicles. The only European country which operated the M3 alongside 20 mm versions of the AML was Ireland, with 61 vehicles in service from 1973 to 2001. In Asia, Malaysia (37 vehicles) is a former operator. Their most active fighting commitment was in Lebanon during the civil war (1975–1990), some being loaned to the Internal Security Forces (ISF). Others served in African local civil wars, mostly as peacekeeping vehicles. The Iraqi vehicles probably served in the Iran-Iraq war. Standard M3 VTT type light Armoured personal Carrier, 1972. Typical North African M3-VTT in desert tan livery, 1980s. M3 VTT preserved at the Military Vehicle Technology Foundation, Portola Valley, California. Irish M3 VTT in the 1980s with the standard TL.2.1.80 turret. Iraqi M3 VTT with a light SBT ring mount, Iran-Iraq war, 1980s. M3 VSB or radar with a RASIT battleground radar system. Saudi Arabian M3 VDA (AA version). SAF licence-built Bosbok at the Tempe School of Armour, Bloemfontein. It is called the Piglet or Anak Babi for its high consumption of diesel during combat patrol operation.